Advanced Document Systems & Supply, Inc. has been an authorized VeloBindÂ® dealer and expert GBC VeloBind machine repair facility since 1994. We are a nationwide leader in refurbishing old velo binding machines as well as selling a full line of new velobind equipment. 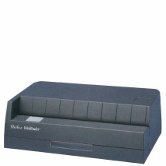 We carry the most popular and workhorse GBC binding machine, the GBC Velobind System 3 pro that binds up to 3 inch thick documents. These gbc machines replaced and are most similar to the following older models of VeloBind equipment: VeloBind model 750, Velo-bind 750B, Velo-Bind 323, Ibico VeloBind 530VB. 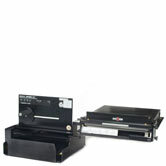 The GBC System 2 Velobind is the velobinder that is capable of binding up to 2 inch documents. It replaced the popular VeloBind model 223. The Tamerica V2000 pro is a new model that is modeled after the popular Velobind 223 and has a time tested design with the bind capacity of up to 2 inches. Lastly, the GBC V800Pro, also known as the System One VeloBind, can bind up to 1 inch of paper. It is the model that has replaced the popular VeloBind 123. 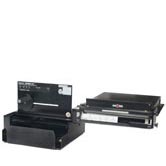 We carry many other velo binding machines that perform the punching operation as well; however, these 4 machines are the only ones that do both. 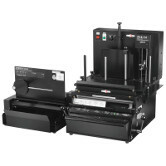 Ask us about our refurbished Velobind machines today. VeloBind is a type of binding that binds paper together using a thin plastic strip to hold the paper along the binding edge. VeloBind is also referred to as strip binding or velo bind. The pages are punched with small round holes. Then the sheets of paper are inserted over small round spikes coming off the flat part of a thin plastic strip. Next you insert a plastic end strip with holes in it over the small round plastic spikes. Next, the document is inserted into the machine with the spikes down. 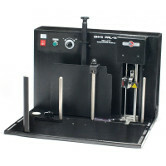 The velobinding machine or velobinder, as it is often referred to, clamps the paper tight and cuts off the excess plastic spikes searing the book closed. 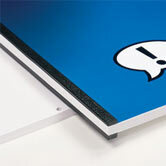 The resulting velo bound document is very secure and provides a sharp, clean professional look. Velobind or velo binding is popular with the legal trade and financial institutions because of its clean secure bind. Another advantage of Velobind is the only mechanical binding available that binds documents up to 3 inches. It is also one of a very few types of binding that can bind up to 14 inch wide documents. 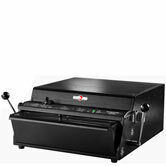 The V110e is an electric VeloBind punch that punches up to 20 sheets and binds up to 200 sheets. It is designed to work with GBC's 4 prong Electric VeloBind Strips. 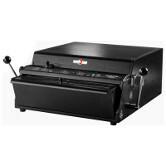 The V2000 Pro VeloBind Machine is a "hot knife" Velo Binding machine. It is a high quality alternative to the more expensive GBC velobind machine. The V2000 PRO VeloBind Machine is an easy to use, reliable and affordable Hot Knife Velobind Machine. 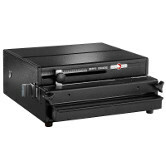 The V2000 PRO creates a secure professional bind using 11 pin hot knife VeloBind strips. 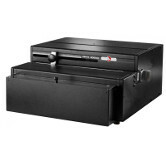 Up to 2 inch thick documents can be bound by the V2000 velo binder. 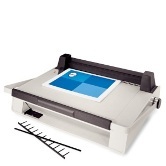 It can punch up to 20 sheets of 20 lb. paper and has a 14" punch and binder width for binding legal size paper. The GBC Velobind 750 uses "hot knife" VeloBind strips for tamper proof security and a neat, professional appearance. 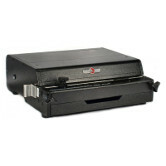 The GBC Velobind 750 binds up to 3 inch thick documents. 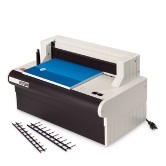 The Velobind System 2 is an affordable, versatile electric punch and bind machine. Uses true "hot knife" VeloBind® strips for tamper proof security and a neat, professional appearance. This machine replaced and is similar to the following older models of VeloBind equipment: VeloBind 223 model and the Velobind 520VB. 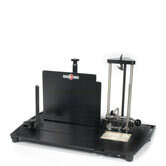 This VeloBind machine features an electric, power operated punch and bind system. It uses the patented "hot knife" system to sear the plastic pins, producing a permanent seal. The Commercial duty, industry standard velobind machine. The System 3 Pro uses "hot knife" VeloBind® strips for tamper proof security and a neat, professional appearance. 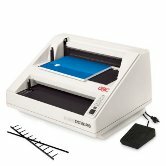 The GBC System 3 pro binds up to 3 inch thick documents and is a workhorse. 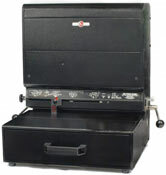 Industrial duty electric binding machine. It uses true "hot knife" VeloBind® strips for tamper proof security and a neat, professional appearance. 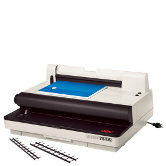 Allows you to separate punch and bind operations for greater productivity.